Fei Yingxiong (Ashin Shu) is a clumsy, broke geek who daydreams and draws martial arts adventures, while pining hopelessly over Bao’er (Madina Memet), a colleague he’s loved for years but has never dared to court. After being humiliated in front of her by his boss (Zhang Ziwen), who also covets Bao’er, a desperate Fei invokes the help of Wong (Vincent Zhao), Huo (Andy On), Chen (Chan Kwok Kwan) and Ip (Dennis To). Somehow it works: he appears in their respective dreams, and shortly afterwards the four folk heroes find themselves transported to 2018. As they try to adjust to the modern world and to figure out how to go back to their time, Fei asks them to train him for a big martial arts tournament, which he intends to win, in order to impress Bao’er and find the courage to confess his love to her. 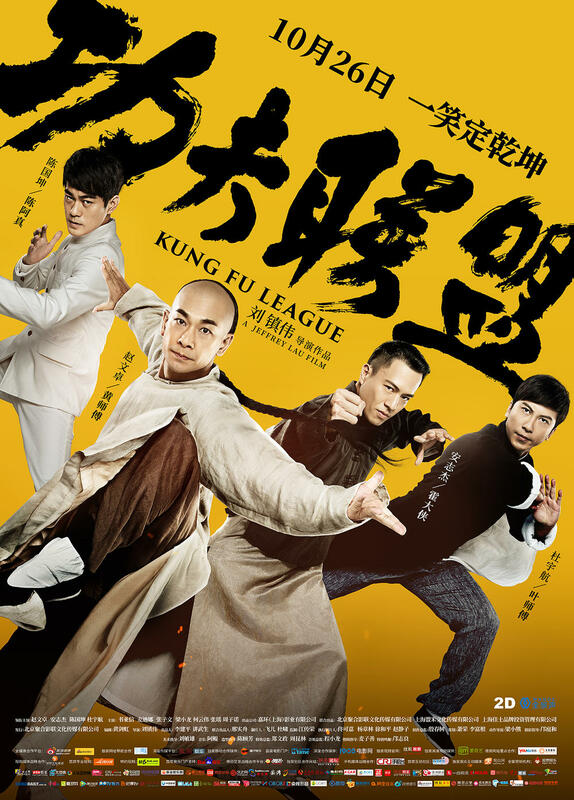 Kung Fu League spectacularly fails to deliver on the promise of its silly but intriguing concept. Jeff Lau’s presence at the helm should have sounded a few alarms: indeed, the film is his usual – and by now quite tiresome – brew of Mo Lei Tau and film spoofing, with a dash of his instantly dated fascination for technology (carried over from the painful Kung Fu Cyborg: Metallic Attraction). And despite having four martial arts icons portrayed by a talented quartet of actors, Lau sidelines them at every turn in favor of Ashin Shu’s Fei Yingxiong, an unlikeable wuss whose cringe-worthy wish-fulfillment is the plot’s main focus. For two thirds of the film, fighting is scarce, just a few skirmishes fussily choreographed by Tony Leung Siu-Hung; much like in Law Wing Cheong’s Iceman, the time-traveling heroes’ vast fighting superiority is translated into cartoonish flourishes – Huo Yuan Jia seems to almost teleport, for example. A fight between Vincent Zhao and Bruce Leung is the most watchable action scene in the film, but still so short it’s unlikely to linger long in anyone’s memory. (Spoiler) The finale is action-heavy, but it’s an interminable and terribly asinine fight scene in which the grandmasters are quickly defeated by a supersuit-wearing villain, before Fei Yingxiong gets to save the day. (End Spoiler). Where Jeff Lau manages to milk his concept a bit more satisfactorily, is in its comedic application. Seeing the four heroes storm out of Hengdian studios on horses (chased by Leung Kar Yan as a director trying to sign them for a contract), then take the subway with these horses is an amusing sight, and so is a brief karaoke duet by Ip Man and Chen Zhen. It helps that the four actors all display unsuspected comic timing. This is especially welcome from Vincent Zhao, who proves excellent at sending up his squeaky-clean hero image: not only is his Wong Fei Hung oblivious to the fact that 13th Aunt isn’t in love with him anymore, he also hilariously passive-agressive once he figures who she’s been cheating on him with. A drunk a disheveled Wong Fei Hung throwing hateful glances: that’s a new sight. Similarly, Andy On reveals himself quite apt at comedy, with a charmingly deadpan performance: witness him order a “free wi-fi” (thinking it’s food) at a fast-food restaurant. Chan Kwok Kwan of course is no stranger to imitating Bruce Lee in a comedic context, and there’s an uproarious running gag about people being surprised that he needs to rip off his shirt at any occasion. Dennis To takes a bit of a back seat, but that’s the point: his Ip Man is aloof to the point of ineffectuality, and late revelation about his character is very amusing. Ironically, he’s a more memorable Ip Man here than in Herman Yau’s Ip Man; The Legend is Born.